The VIEW has been able to be controlled by a smartphone from the very beginning (in fact, the very first prototype long before the Kickstarter only had an app interface), but it's always been via a web app interface. Starting out, this had many clear advantages: rapid development, flexibility and no hassle of deployment through app stores. Over time, however, I've had many requests for a native app, and when the time came to rewrite the existing web app anyway (since I didn't have all the current features in mind when I first started it in the early stages), I realized I needed to include native support. So almost a year ago now, I began rewriting the VIEW's app in a way that would work for web, iOS and Android. The new app requires the latest v1.8 beta firmware on the VIEW. The official v1.8 stable release firmware is nearly ready and will be released as soon as possible. To update to the beta firmware, use the SD card method (http://docs.view.tl/#update-via-sd-card) or enable Settings->Developer Mode to access beta versions via wifi. Below, some of the new features are highlighted. I'm working on official documentation now as I complete the v1.8 release, but feel free to jump in now and check it out. Read more to see what's new. The entire interface was reconsidered with a more consistent theme and full support for all the options and settings. A lot of thought was put into making an interface that was simple to use but still flexible enough to support a wide range of features. Another important consideration was to use a dark theme that would be suitible for use during night photography. A native app has the advantage of being able to use a dark-themed keyboard as well (at least on iOS). One of the new features included with the new app is the ability to make live changes to a time-lapse while it's running. Parameters that can be changed include ramping mode, interval mode, interval, exposure offset, and more. The changes can be applied immediately or gradually over a set number of frames. Another part of the app that has been fully redesigned is the keyframe editor for focus and motion. This new interface allows visually editing keyframes where each axis can have keyframes at different points in time (the old web interface had common times for keyframes across all axes). 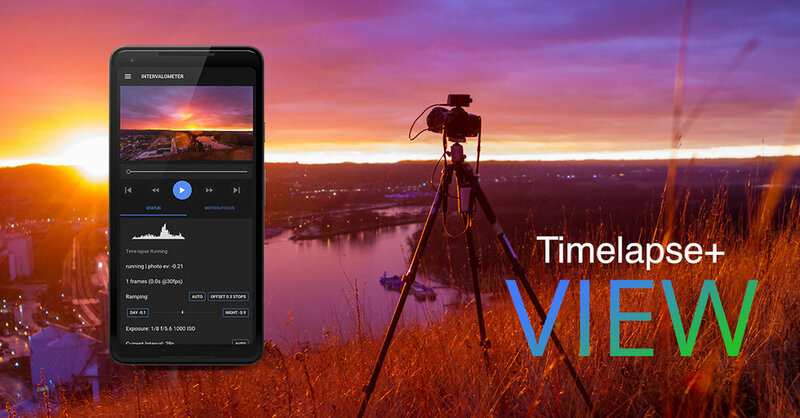 The VIEW can now be set to run record time-lapse on a weekly schedule with daily start/stop times. Auto ramping can also be used with scheduled time-lapse. When the VIEW is set for auto ramping and scheduling is enabled, the VIEW will take a reference photo when it's first started. The exposure for each daily session will then be matched to this reference exposure, making for a consistent exposure value throughout the multi-day series.